Description: Milking systems used on dairy farms have vacuum lines that remove and transport the milk from cows' udders to bulk cooling tanks. Vacuum gauges, or dairy manometers, are an important part of the milking system and are used to measure the pressure in the vacuum line. 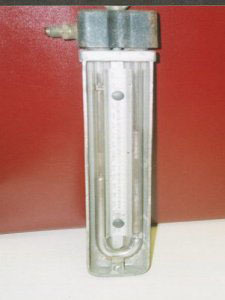 The mercury dairy manometer is one type of gauge that has been used in milking systems. Mercury dairy manometers are usually a U-shaped tube containing about 12 ounces of liquid elemental mercury. One end of the tube is connected directly to the milking pipeline by a vacuum hose. The other end of the U-tube is open to the atmosphere so that when the pump is running the farmer reads the height difference between the two columns of mercury. operation of the milking process and must be accurately measured - less vacuum leads to longer milking time and greater energy consumption; a high vacuum leads to mastitis among the dairy cattle. The vacuum pressure in a mercury-added dairy manometer is read from the side of the mercury-containing tube. Non-mercury manometers display the vacuum pressure on a dial or a digital display. Potential Hazards: Even with proper use, continuous releases of mercury occur as the mercury vaporizes from the end of the open U-tube manometer to the atmosphere. 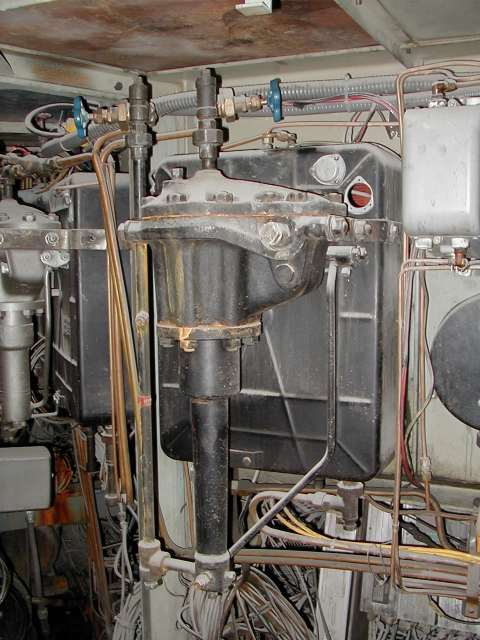 Mercury spills may also occur during routine servicing of the mercury in the manometer. During servicing, the manometers are often emptied and filled with new mercury. Farmers that do this on-site end up with a lot of elemental mercury waste that must be disposed of as hazardous waste and/or recycled. The large amount of mercury contained in dairy manometers, combined with the fact that they often have an "open-system" (one end of the U-tube containing the mercury is open), creates a high potential for a mercury release or spill. Such a spill would present a significant risk of exposure as well as extensive cleanup costs. Spills greater than one pound of elemental mercury (about two tablespoons) must be reported to the appropriate state environmental agency. Persons that have been exposed to a mercury spill should contact the public health department or poison control center. Recycling/Disposal: Because of the amount of mercury in dairy manometers, they are prohibited from being disposed of in landfills and must be managed as hazardous waste. Some states, including Connecticut, Maine, Massachusetts, Minnesota, New Hampshire, New York, Vermont, and local municipalities have offered a mercury collection program specifically for farmers to dispose of their old mercury dairy manometers. When replacing an old mercury-containing dairy manometer, farmers should also check with the vendors to see if they will accept the old manometer when they install the new mercury-free gauge. Licensed hazardous waste professionals should collect, transport, and recycle mercury from the manometers. The mercury collected from the dairy manometers should be sent to a reclamation facility for recycling. 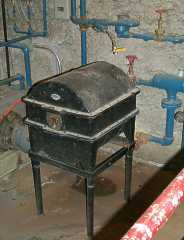 Statutes and Other Information: Many states, including Connecticut, Louisiana, Maine, Minnesota, Rhode Island, and Vermont, have phased-out the sale and distribution of mercury dairy manometers. 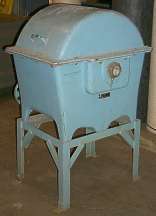 Minnesota also banned the use of mercury dairy manometers and required all mercury manometers to be removed from service in 2000. Other states, including California, Illinois, Massachusetts, and New York prohibit the sale of mercury-containing measuring devices, including dairy manometers. These states, however, do allow manufacturers to apply for an exemption, which, if approved, would allow them to sell these products in the state after the effective phase-out date. Other states have focused on outreach and education programs for dairy farms that encourage the proper disposal of mercury manometers and the use of non-mercury devices, such as bourbon gauges, aneroid, electronic, or digital manometers. Some state and local agencies have even initiated specific collection programs for ensuring proper disposal of mercury dairy manometers, and many include an exchange program, where farmers can exchange their old mercury dairy manometer for a non-mercury replacement device. Description: Flow meters are used in water and sewage treatment plants, power stations, and other industrial applications. They may also be used in public water supply facilities, including pumping stations, distribution systems, and treatment plants. Flow meters are custom-designed for specific applications. The design depends on the substance being measured (liquid or gas) and the flow rate needed (volumetric or mass). A mercury flow meter can contain as much as 5,000 grams of elemental mercury. Mercury-containing flow meters were commonly used prior to the 1970s. Mercury is not used in the manufacture of new flow meters; however, older flow meters still in use may contain mercury. Mercury flow meters usually have a needle indicator - they are also sometimes called analog flow meters. Non-mercury alternatives include digital, optical, and ball-actuated flow meters. Purpose of the Mercury: Flow meters measure the flow of gas, water, air, and steam. The mercury in a flow meter is typically encased in a manometer, which is attached to an assembly or pipe system. The mercury in this manometer rises and falls with changes in the rate of flow of the liquid or gas. Potential Hazards: If a leak or break occurs in the mercury flow meter, persons should immediately contact their state environmental agency for instructions on proper clean-up and disposal. They should also contact their public health department or poison control center if they have been exposed to the mercury. Most industrial facilities and plants have an emergency response plan in the event of a mercury spill or other accident. Recycling/Disposal: Mercury flow meters must be disposed of as hazardous waste through a licensed hazardous waste facility. If the flow meter is being repaired or replaced, the parts of the meter that have been in contact with the mercury should be regarded as hazardous waste and also be removed and disposed of properly. The elemental mercury collected from the flow meter may be sent to a mercury recycler for reclamation. Statutes and Other Information: The amount of mercury contained in mercury flow meters (greater than one gram) would make these products subject to sales restrictions in certain states, including Connecticut, Louisiana, and Rhode Island. Other states, including California, Illinois, Maine, Massachusetts, New Hampshire, New York, and Vermont prohibit the sale of mercury-added flow meters under the category of mercury-containing measuring devices. These states do allow manufacturers to apply for an exemption, which, if approved, would allow them to sell these products in the state after the effective phase-out date. However, research indicates that mercury flow meters are no longer produced or available for sale in the U.S. Description: A hydrometer is an instrument used to measure the specific gravity of a liquid - the ratio of the density of the liquid to the density of water. Hydrometers are often used in cooking, especially in beer and wine making. They are typically made of glass and consist of a cylindrical stem and weighted bulb, which makes the device float upright in the liquid solution. Historically, elemental mercury was used in hydrometers as a weight. The amount of mercury was small - often less than one gram, depending on the size of the instrument. Non-mercury hydrometers that use lead ballast for the weight are now used. Hydrometers are also used in laboratories and in school science classrooms to measure soil particle size distribution in a soil suspension. Non-mercury soil hydrometers are available that use lead for the ballast. Purpose of the Mercury: The mercury was used in hydrometers as a weight so that the device would be buoyant in a liquid solution. For example, a hydrometer is used when making wine because it floats to a certain height depending on the amount of sugar in the wine - the more sugar in the wine, the denser the liquid and the higher the hydrometer "floats." As the wine ferments, and the yeast turns the sugar into alcohol, the wine becomes less dense and the hydrometer "sinks" or floats lower. Using a hydrometer allows the winemaker to monitor the progress of fermentation. Potential Hazards: Hydrometers are usually made of glass, making a mercury hydrometer susceptible to breakage. If a leak or break occurs, persons should immediately contact their state environmental agency for instructions on proper clean-up and disposal. Persons that have been exposed to a mercury spill should contact the public health department or poison control center. Recycling/Disposal: Mercury hydrometers must be disposed of as hazardous waste through a licensed hazardous waste facility. The mercury collected from the hydrometer will be sent to a mercury recycler for reclamation. Statutes and Other Information: Depending on the amount of mercury in the hydrometer (greater than 10 milligrams), this product may be subject to sales restrictions in certain states, including Connecticut, Louisiana, and Rhode Island. Other states, including California, Illinois, Maine, Massachusetts, New York, and Vermont prohibit the sale of hydrometers under the category of mercury-containing measuring devices. These states do allow manufacturers to apply for an exemption, which, if approved, would allow them to sell these products in the state after the effective phase-out date. However, research indicates that mercury hydrometers are no longer produced or available for sale. Description: Hygrometers and psychrometers are instruments used to measure relative humidity (i.e., the moisture content of the air). Each device consists of two separate mercury thermometers – a "dry bulb," or regular thermometer, and a "wet bulb" thermometer, which has a bulb that is kept constantly wet, often times with a cotton or linen wick around the bulb. The amount of mercury ranges from three to seven grams. Hygrometers and psychrometers function similarly; however they are used in different applications. Hygrometers are commonly used to monitor the moisture levels in cigar and tobacco humidors used by manufacturers and cigar aficionados. In residential and commercial settings, hygrometers can monitor the humidity to prevent the growth of mildew and dust mites. Atmospheric scientists and weather enthusiasts use psychrometers to monitor outdoor humidity and moisture content. A sling psychrometer is a specific type of psychrometer where the thermometer bulbs are attached to a handle so that the device can be swung around in the air. These are often used in school science classrooms for demonstrating to students how to measure atmospheric humidity. Purpose of the Mercury: Mercury was used in the devices because it changes in response to temperature – it expands when it is heated and contracts when it is cooled. The dry bulb mercury thermometer measures the ambient temperature (current temperature of the air), while the evaporation from the water on the wet bulb causes its temperature reading to drop and show a lower temperature than the dry bulb. The humidity is then calculated from the difference in the temperatures shown by the difference in the mercury levels of the two thermometers. Potential Hazards: Hygrometers and psychrometers are often made of glass, making them susceptible to breakage. Furthermore, using a sling psychrometer to measure atmospheric humidity requires the person to swing the psychrometer around in the air, and it can easily be thrown or dropped. If a leak or break occurs, persons should immediately contact their state environmental agency for instructions on proper clean-up and disposal. Persons that have been exposed to a mercury spill should contact the public health department or poison control center. Recycling/Disposal: Mercury hygrometers and mercury psychrometers must be disposed of as hazardous waste through a licensed hazardous waste facility. The mercury collected from these devices will be sent to a mercury recycler for reclamation. 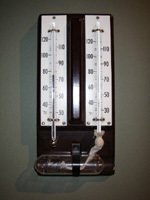 Statutes and Other Information: The amount of mercury in the hygrometer or psychrometer (greater than one gram), makes these products subject to sales restrictions in certain states, including Connecticut, Louisiana, and Rhode Island. 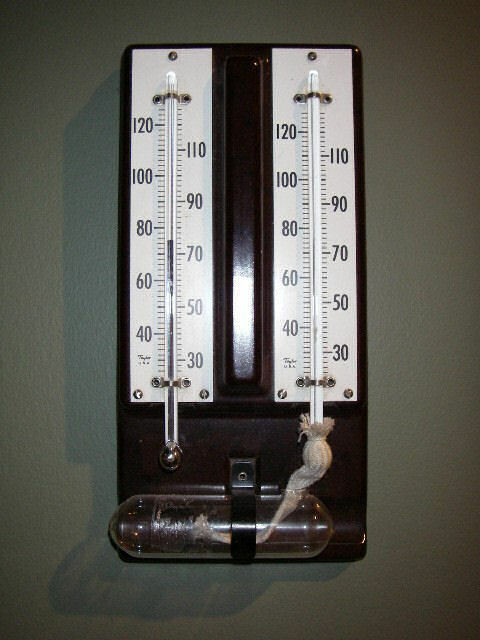 Other states, including California, Illinois, Maine, Massachusetts, New Hampshire, New York, and Vermont prohibit the sale of all types of mercury hygrometers and psychrometers under the category of mercury-containing measuring devices. Two manufacturers notified the IMERC-member states in the 2001 and 2004 triennial reporting years of their manufacture and sale of mercury hygrometers and/or psychrometers. However, in 2007, these manufactures, Princo Instruments, Inc. and Taylor Precision Products (hyperlink to database details), have since phased-out the manufacture and sale of mercury-added hygrometers and psychrometers. Additional research has not identified any manufacturers that continue to use mercury in these products. New hygrometers are digital, and non-mercury psychrometers are alcohol- or mineral spirit-filled. Description: Pyrometers are used to measure extremely hot materials in foundry applications and exhaust temperatures for large engines. The typical pyrometer is equipped with a dial gauge and temperature-sensing stem, or "thermocouple." It is difficult to tell the difference between mercury and non-mercury pyrometers. 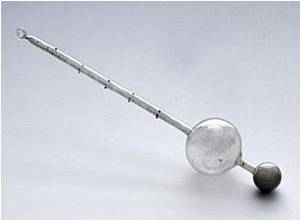 If the pyrometer does contain mercury, the mercury will be contained in the thermocouple, which is a thin glass tube connected to the pyrometer gauge. The amount of mercury in these devices ranges from 5 to 10 grams. Mercury pyrometers are nearly obsolete, as they are being replaced with nitrogen probes and digital instruments. New pyrometers are no longer manufactured with mercury. Purpose of the Mercury: A pyrometer is essentially a thermometer that can measure extremely hot temperatures. The mercury thermocouple acts as the temperature sensor for the device. When the thermocouple is inserted into the firing chamber, kiln, furnace, engine, or other heating system, the mercury column rises and falls to indicate the degree of heat. Potential Hazards: If a pyrometer leaks or breaks, persons should immediately contact their state environmental agency for instructions on proper clean-up and disposal. They should also contact their public health department or poison control center if they have been exposed to the mercury. Recycling/Disposal: Mercury pyrometers must be disposed of as hazardous waste through a licensed hazardous waste facility. The mercury collected from the pyrometer should be sent to a mercury recycler for reclamation. Statutes and Other Information: The amount of mercury contained in pyrometers (greater than one gram) would make this product subject to sales restrictions in certain states, including Connecticut, Louisiana, and Rhode Island. Other states, including California, Illinois, Maine, Massachusetts, Minnesota, New Hampshire, New York, and Vermont prohibit the sale of mercury-added pyrometers under the category of mercury-containing measuring devices. These states do allow manufacturers to apply for an exemption, which, if approved, would allow them to sell these products in the state after the effective phase-out date. However, research indicates that mercury pyrometers are no longer produced or available for sale.